Recently, I’ve been really struggling with my previous decision to study traditional culinary rather than classic french pastry. 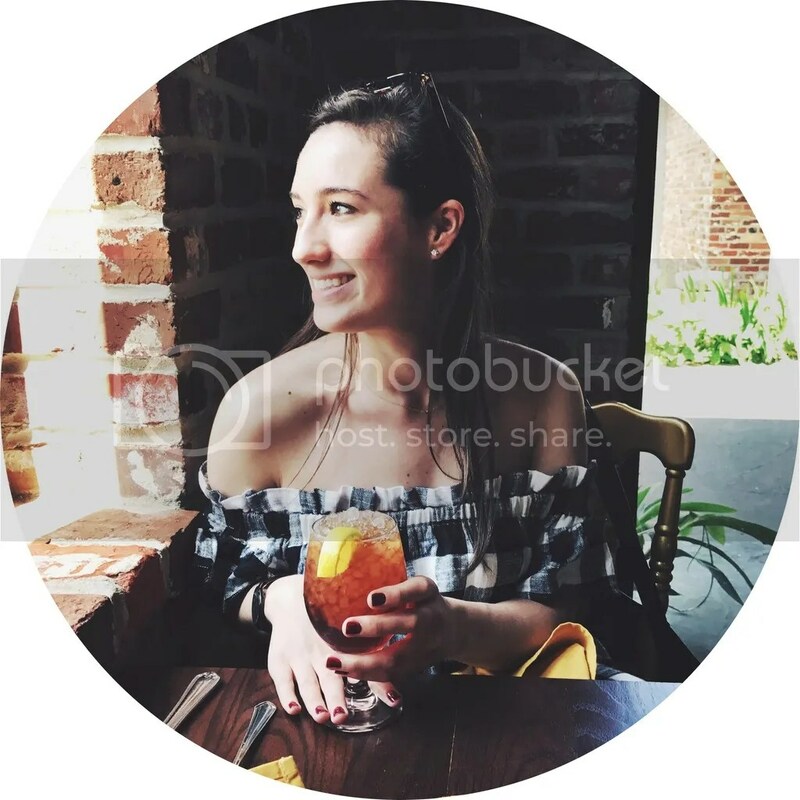 I was enrolled in the pastry program for 9 months starting in August of my senior year, and I changed my mind only a month before classes began. I just got nervous. I convinced myself that pastry was too narrow of a scope. What if I wanted to be a private chef or work in a test kitchen? I would need the culinary background that pastry wouldn’t provide. Clearly, I had been spending too much time on salaries.com rather than listening to my gut. But, at the same time, I completely understand my decision. It was practical. I know how to deconstruct proteins and have significantly improved my knife skills. But every time I go to refill my water bottle, I gaze into the pastry classroom and daydream about how I could be making elaborate sugar sculptures rather than deboning that dead rabbit sitting bloodily at my station around the corner. Fortunately, we do learn some pastry in level 2. I have already done most of the things we are learning at home, but it is fun to learn how to do things in different ways. Like pastry crust, for example. I’ve been making crust for years, but in class I learned entirely new methods; like this pate brisee recipe. After we made quiches in class, I knew I had to made them at home with the new mini spring form tart pans I bought off Amazon. Mix together the salt and flour and arrange neatly in a pile on your countertop. With a bench scraper, pastry blender or two knives, cut the butter into the flour until it resembles course sand. Push the flour and butter mixture into a neat pile, and then create a well in the center. (you should be able to see your counter or cutting board). Pour the water in the center of the well, and gradually incorporate the water into flour. At this point you can put your tools aside and work with your hands. Collect the dough into a rough pile, and with the bottom of the palm of your hand, push the dough forward in a sweeping motion. Collect the dough again, and repeat until the dough just comes together. Be sure not to overwork the dough, or else the heat from your hands will melt the butter. Create a disk with your hands and wrap in plastic wrap. Refrigerate for at least 30 minutes or overnight. While the tart shells are chilling, cut out circles larger than the mini tart shells (enough so that there is enough overhang to cover the edges of the crust) Crumple up the circles so they are easier to manipulate. Roll out the dough to about a ¼ of an inch. Gently press into your molds and with a fork, puncture the bottom of each tart multiple times to prevent the dough from rising or bubbling during baking. 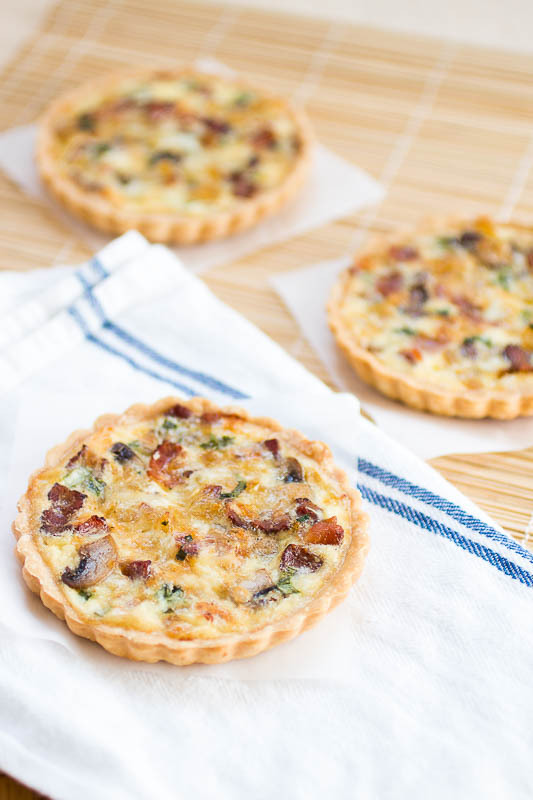 Place the parchment paper on each of the tart shells and fill with uncooked beans or pie weights. Bake for 10 minutes. Remove the parchment and beans/weights and bake for an additional 15 minutes or until lightly golden brown. Over medium/low heat, slowly caramelized the finely chopped onions until golden brown. Reserve. Saute the pieces of sliced bacon until crispy and let drain and dry on a paper towel; leaving some of the bacon grease in the pan. Saute the mushrooms in the grease over medium heat until tender, and reserve. 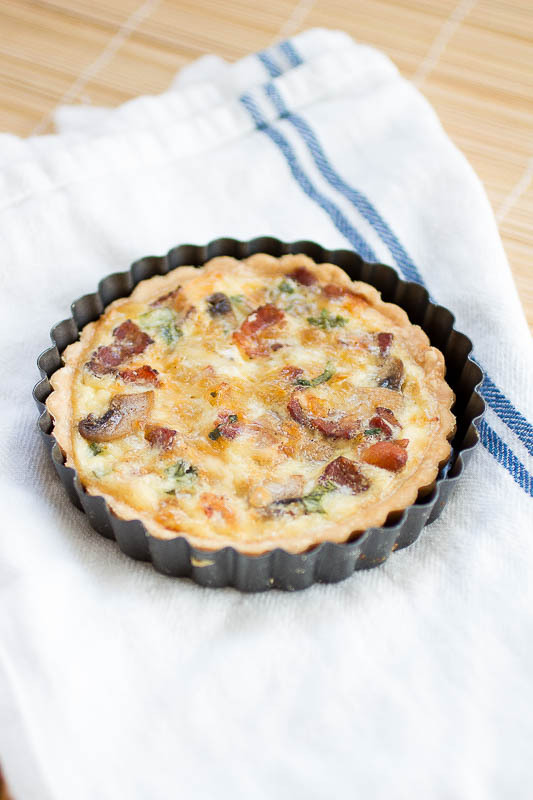 Sprinkle some of the mushrooms, onions and bacon on the bottom of each of the tart shell. Then sprinkle each with the grated cheese. Whisk together the egg, milk, cream, salt, cayenne and nutmeg in a small bowl. Evenly distribute the mixture between the shells. Keeping the oven at 325, bake for about 10 minutes. When the tops are very lightly golden and no longer giggle when moved, remove from the oven and let cool for at least 5-10 minutes. 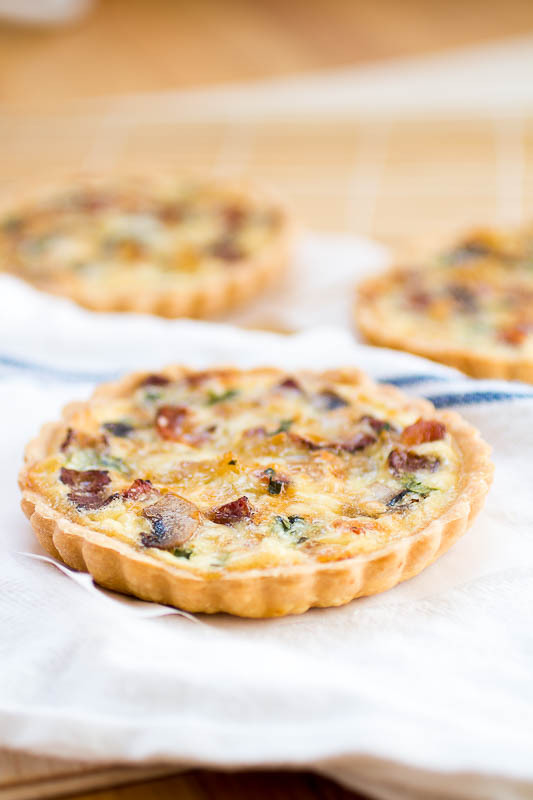 Carefully remove from the quiches from their shells and serve. What is the bake time and temperature once the filling is added? Bake at 325 for about 10. This can vary a lot depending on how deep your tart shells are, so check them frequently. The second they no longer giggle on the inside, remove them immediately because they tend to become dry if over baked. Thanks so much for pointing that out!